The launch of the new Register of Antarctic Species (RAS) is planned for July, during the Twelfth SCAR Biology Symposium. Meanwhile, the preparations to get this Portal populated are ongoing, and this included an intensive training of the involved editors in the use of the online platform. Over the last year, several actions have been undertaken to create a full-blown Antarctic Species Register. As a marine Antarctic register (RAMS) already existed, it seemed a logical step to let this marine register form the basis for an all-species-all-environments Antarctic register, which will be called RAS. As a first step towards RAS, a group of Antarctic taxonomic experts from around the globe came together to discuss the expansion of the scope of the very successful register of Antarctic Marine Species into all realms, including, marine, freshwater, terrestrial etc. 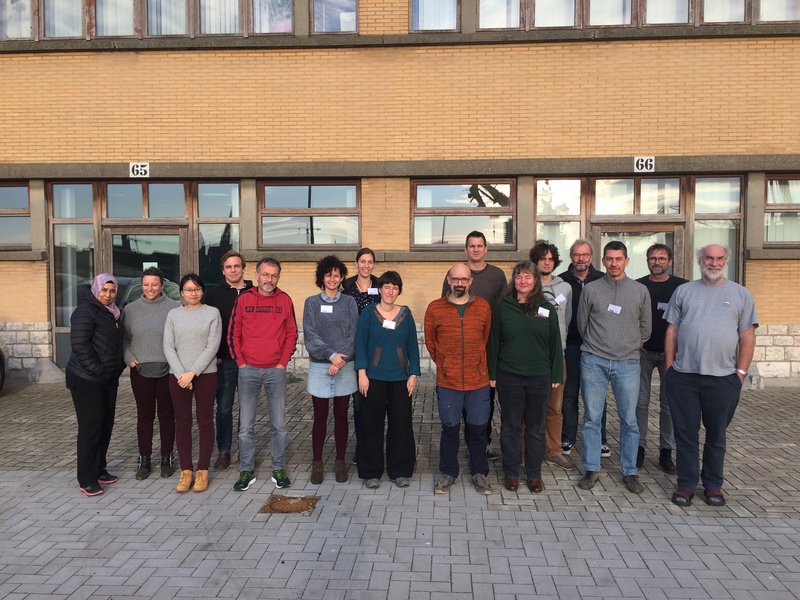 This workshop took place from 20 to 22 September in Leuven (Belgium) and was sponsored by the Antarctic Biodiversity Portal (biodiversity.aq) and the SCAR expert Group on Antarctic Biodiversity Informatics (EG-ABI). The organisation was in the hands of RBINS, KULeuven, University Libré de Bruxelles & VLIZ. During the workshop, the geographical scope was defined, making sure that all involved editors talk about the same region. The current gaps were identified and plans were made to fill these. In addition, the non-marine experts were introduced to Aphia and its online platform, through which RAS will be maintained. Currently, the WoRMS Data Management Team and the Antarctic Biodiversity Portal are working together with the RAS experts to get as many Antarctic non-marine species added to the list as possible. This happens in strong collaboration with the WoRMS taxonomic editors, who – where possible – give advice on the taxonomic correctness and status of these new names. The new RAS portal will be launched during the XIIth SCAR Biology Symposium that will take place from 10-14 July, in Leuven. Prior to the symposium, a number of the RAS experts will join for another workshop, where the progress made thus far and the future plans can be discussed. The input of the WoRMS Data Management Team and The Antarctic Biodiversity Portal into this initiative is made possible through LifeWatch Belgium, which is part of the E-Science European LifeWatch Infrastructure for Biodiversity and Ecosystem Research. LifeWatch is a distributed virtual laboratory which is used for different aspects of biodiversity research. The Taxonomic Backbone of LifeWatch aims at bringing together taxonomic and species-related data and at filling the gaps in our knowledge. In addition, it gives support to taxonomic experts by providing them logistic and financial support for meetings and workshops related to expanding the content and enhancing the quality of taxonomic databases.